Why Refer to Live In Place? As a trusted senior advisor, your main professional and compassionate concern is for your patients and clients. You want home modification and mobility solutions to be managed with real care by real professionals with real expertise. That is exactly why so many professionals trust their referrals to Live In Place. They recognize that Live In Place has a unique methodology, taking a holistic approach to home modification for improving mobility and accessibility so that clients can actually thrive at home. The most precise clinical and therapeutic considerations – unique for each person – go into the design and implementation of every Live In Place solution. 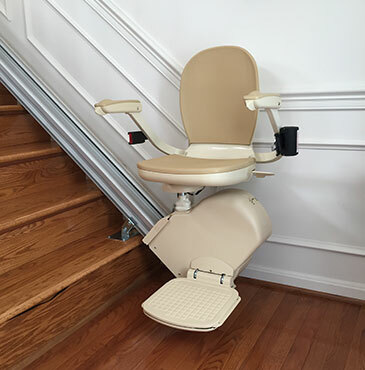 This includes stair lifts, ramps, railings, grab bars, and bathroom safety solutions. Live In Place’s “Best in Class” evaluations, prior to the client purchase and install of any equipment, are conducted by certified occupational and physical therapists trained in aging-in-place accessibility and mobility options. This ensures peace of mind that the home modifications are right for your patient or client upon discharge, improving their safety while retaining their independence. Quick Response: A sudden medical event or tragedy is stunning, and it can leave a family overwhelmed with many decisions and changes that may need to be made. Live In Place’s Certified Aging-in-Place Specialists respond promptly and work quickly with families to identify challenges and solution options for extended living at home, whether it’s because of progressive illness or traumatic injury. Leave the work to us! Just call (703) 433-0380 to discuss your patient’s or client’s needs, and we’ll take it from there. 7-Point Live In Place Certified Assessment: Our clients appreciate our thorough, professional 7-point evaluation and follow-up recommendations, which consider the home environment and every aspect of a client’s needs (i.e. physical, cognitive, emotional, and spiritual). Each client has unique conditions with their body mechanics, disease progression, and individual personality which need to be taken into consideration before installation of any equipment. Additional considerations include an evaluation of the residence layout and special preparations for the loved one’s return home. Thoughtful Follow-Up: Each client and family receives close attention, as Live In Place specialists listen to their concerns, with specific considerations factored into the installation plan. As the work progresses, the client is updated and consulted. Contact us today! We’ll be happy to discuss how we might help your client or patient. Call (703) 433-0380 or request a consultation.